The TORREY waterproof receiving bench scale was designed for busy environments where accuracy, reliability and strong built products are needed. The hermetically sealed display guarantees reliable performance in high humidity or dusty environments. The backlit, alphanumeric LCD screen is adjustable to clearly show the weight of portioned items, even in dark areas. The EQB-20/40-W features stainless steel construction and a hermetically sealed indicator ideal for seafood packers, slaughterhouses, poultry, restaurants, pharmaceutical companies and more! The EQB-20/40-W is an ideal tool for your business, featuring a totally sealed indicator to guarantee excellent performance in humid environments. The AC adapter and built-in rechargeable battery includes an auto power-off function to save power. The large stainless steel base is designed to handle the rough demands of every day weighing. With a footprint of only 12" x 15", this scale meets the needs of your business while requiring minimal space. The EQB-20/40-W also features an easy to read display mounted on a 19" stainless steel pillar. 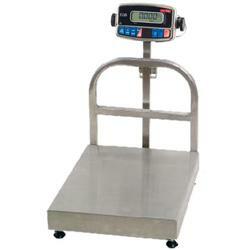 With a capacity of 40 lbs x .01 lbs, this scale provides the precision you need to help maximize your profits. Attractively designed and tough enough for everyday professional use, the EQB-20/40-W will be a welcomed addition to your business. Whether you are packing seafood or weighing poultry in a slaughterhouse, the EQB-20/40-W will meet the weighing needs of your business.